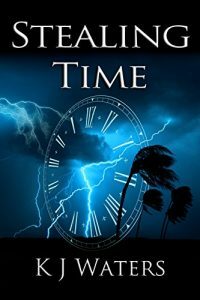 Stealing Time is a “Breathtakingly original” time travel adventure that will keep you on the edge of your seat. As Hurricane Charley churns a path of destruction towards Orlando, Florida, Ronnie Andrews scrambles to prepare for the storm. She seeks shelter at her boyfriend’s weather lab but what she finds there is more terrifying than the storm. Her best friend Steph is thrust into the middle of the hurricane and it quickly turns into a living nightmare as she is faced with losing everything. KJ Waters is the author of the #1 best-seller Stealing Time and the short-story Blow. The second book in the series, Shattering Time, reached #6 on the UK Amazon site, and was #2 as a hot new release for one category, seating neatly after Michael Crichton’s Dragon Teeth. In addition to her writing, she is the CEO of Blondie’s Custom Book Covers, the co-host of the popular podcast Blondie and the Brit, and provides author consulting covering branding, social media, and publishing. She has a Master’s in Business and over 18 years of experience in the marketing field. Before quitting her job to raise a family and work on writing she was the Director of Marketing and communications for a national behavioral healthcare company.